Major League Baseball’s 2010 amateur draft included the names of 36 players with ties to the New York Collegiate Baseball League. In the last three drafts 112 former NYCBLers have heard their names called. While modest in comparison to the totals of the Cape Cod League, the NYCBL, in its 32nd year of existence, continues to build an impressive resume. Time will tell if names like Adam Schraeder (Hornell ’08), Jesse Bosnik (Brockport ’08) and Will Harford (Geneva ’08-’09) can climb to “The Show” like Dallas Braden (Hornell ’03), John McDonald (Cohocton ’93) and Hunter Pence (Schenectady ’02). Among those called included the names of two former Webster Yankees. Add to that one free agent signing and the Webster organization, in just its fifth year of business, has established itself as a proving ground for future professionals. In all, five Webster alums have received a draft day call, and seven former players currently earn paychecks from baseball. Cory Brownsten (’08) and Dan Jurik (’09) earned draft status. Both got the call from the Atlanta Braves – Brownsten in the 15th and Jurik in the 25th round. Although the duo never wore Webster pinstripes together, they are teammates with the Gulf Coast Braves. Brownsten announced his arrival to the professional ranks going 2-3 with a run scored in his first pro game. “Browny” has started three games for the GCL Braves tallying five hits in 11 trips to the plate for a .455 average. Jurik has made two appearances out of the bullpen for the Braves tossing five innings with an ERA of 3.60. Marcus Nidiffer wasted little time making his presence known. The free agent signee of the Houston Astros grabbed front page recognition on the team’s minor league site. Playing for the Greeneville Astros of the Rookie Appalachian League, “KB” is hitting .438 in five starts with five doubles, two RBI and two runs scored. Nidiffer joins Patrick Urckfitz (’08) in the Astros’ organization. In his third season of work in Houston’s farm system, Urckfitz comes out of the bullpen for the Lancaster Jethawks of the Class A Advanced California League. “Urck” is 3-2 in 24 appearances for the Jethawks. He has struck out 48 and walked 13 in just over 47 innings of work. In his last ten appearances Urckfitz has an ERA of 2.77. 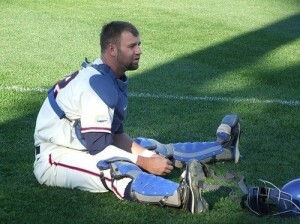 Urckftz joins two other NYCBL alums on the Lancaster roster – Ashton Mowdy (Geneva ’07) and Shane Wolf (Elmira ’07). Gary Helmick (’06-’07) and Jason Stifler (‘o6-’07) both signed as free agents with the Baltimore Orioles. The two from Towson State play with the Delmarva Shorebirds of the Class A South Atlantic League (“Sally). In 40 games, Helmick has 29 hits including seven doubles and two home runs to go with 16 RBI. The second baseman has stolen eight bases on the campaign. Stifler has played 23 games behind the plate collecting nine hits and five RBI. The Cincinnati Reds took Bryan Gardner (’06-’07) in the 34th round of the 2008 draft. Gardner currently pitches for the Traverse City Beach Bums of the independent Frontier League. Two other Webster alums, Jordon Herr (’06) and Jordan Petraitis (’06) heard their names called on draft day. Neither play professional baseball at this time. One Response to "Minor Tour With The Webster Yankee Alums"
If you’re in the area, and you haven’t checked out one of the games yet, you really need to go. I saw both games this weekend, and it was the most fun I’ve had in a long time.